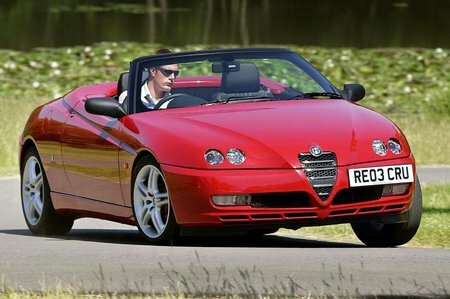 Used Alfa Romeo Spider Review - 1996-2004 | What Car? What's the used Alfa Romeo Spider sports like? The Alfa Romeo Spider is a soft-top sports car that looks and sounds great. Older cars in good condition can now be bargain buys. The owners' club can offer advice and recommend specialist garages, but Spiders are quite rare, so you'll have to scout about to find one. The quick steering and raspy engines are tempting, but Spiders ride harshly and worn parts can make them feel vague and unpleasant to drive. The body shimmies and shakes more than that of the GTV coupe on which it's based. The interior looks cheap, and although Alfa Romeo improved it in 2003, rattles are still to be expected. In addition, the seats get shabby unless you buy a Lusso model, which has a leather interior. It's only a two-seater but, even so, space is far from generous inside and the boot is small.